Head of the Reform and Reconstruction Alliance, Sayyid Ammar al-Hakim, met with Head of the Iraqi Alliance for Feyli Kurds, Sheikh Asadullah Al-Feyli, and indicated that the Feyli Kurds represent a qualitative addition to the Iraqi social fabric, added that "they have proven their belonging to Iraq and their loyalty to this good land despite all attempts of displacement and extermination". His eminence covered the latest developments in the Iraqi political situation, and stressed the need for a real representation of this segment in the Iraqi state in order to demand rights and expresses their voice and presence. 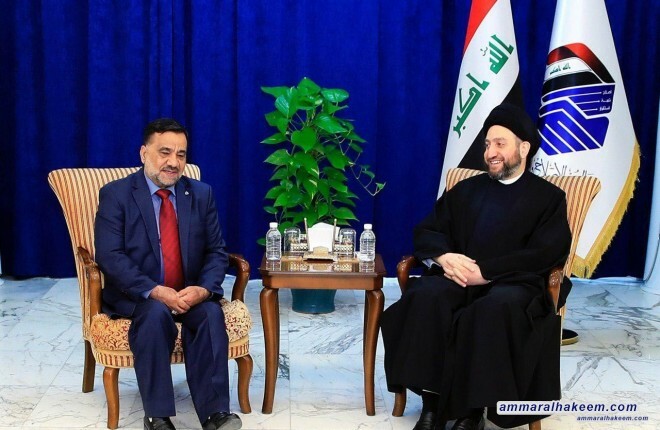 Both recalled the historical relationship between the Feyli Kurds and Imam Sayyid Mohsen al-Hakim, Shahid al-Mihrab and Aziz Iraq "sanctified their souls". Sheikh Asadullah stressed the importance of great national role that Sayyid Ammar al-Hakim addresses, and that it represents a qualitative extension of the experience of Shahid al-Mihrab and Aziz of Iraq, and pointed out that the Feyli Kurds are a large social resource of elites and competent people keen to serve their country and people.